Want to build strength and explosiveness, pack on muscle mass, and shred body fat in the most efficient way possible? Behold the power of Jim's Power-Pyramid training technique! What would you think of a training program that promotes muscle-building, strength, and power development for the whole body in every workout—while also maximizing fat loss? That's my kind of routine: one that produces a strong, shredded physique in the most efficient manner possible. 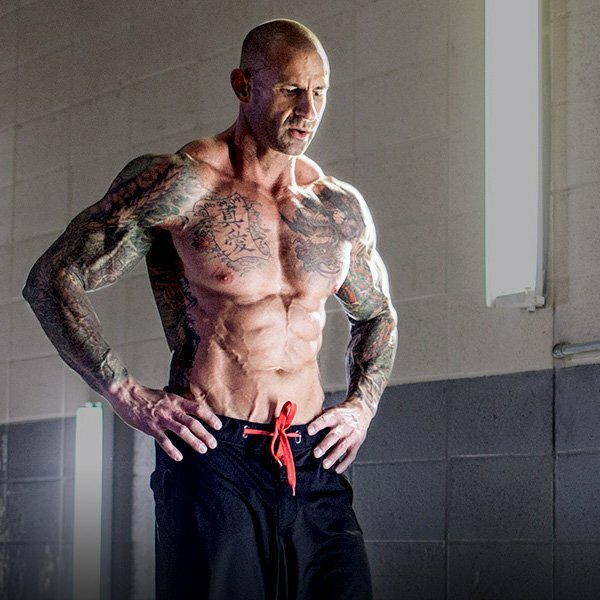 Truth is, most of my programs on JimStoppani.com cover all these bases, but none of them does it quite like my Power-Pyramid technique. Periodization is the foundation of pyramid-style training. When following a classic periodized program, you stick with a specific rep range on each exercise. These rep ranges usually change on a scheduled basis, either in weekly microcycles or every time you train a given muscle group. But you can also change the rep ranges for every set of each exercise you perform. For example, a periodized workout might include 12-15 reps for your first set, 8-10 reps for your second set, and 3-6 reps for your third and final set. Or it can go in the opposite direction, from low reps to high reps. If the changes you make in your set-to-set rep ranges follows this kind of linear progression, it's referred to as a pyramid technique. Ascending Pyramid: This pyramid starts with light weight and high reps, and with each successive set the weight gets heavier and the reps get lower. Descending Pyramid: This pyramid starts with heavy weight and low reps, and each successive set gets lighter while the reps get higher. Ascending/Descending Pyramid: Also known as a "triangle pyramid," this pyramid starts with weight increases and finished with weight decreases. If the order is reversed and you start with weight decreases and finish with weight increases, it is known as a descending/ascending pyramid. My approach for many years has been to modify classic training techniques to make them more effective, and that's exactly what I've done to create the Power-Pyramid workout. My workout uses an ascending/descending pyramid as the template, although it might be quite different than any pyramid routine you've ever seen. My workout changes not only the weight and reps each set, but also the speed at which you do the reps. This modification will help you build greater strength and muscle mass—and give you more power. Power development is critical to maximizing your gains in the gym, and the best way to achieve this is by upping the speed to make each and every rep fast and explosive. For each exercise in the Power Pyramid, you'll do a total of 6 sets. The rep counts of these 6 sets will be: 8, 5, 6, 6, 12, 15. Do the first training set with a very light weight that allows you to perform 30 reps or more—but just do 8 reps and stop. You don't want to start out by fatiguing your muscles when you're training for power. The fatiguing sets will come later. Perform these 8 reps as quickly and explosively as possible during the positive portion, then slow and controlled on the negative portion. This first stage will serve as both a warm-up and a power-building set. For set 2, increase to a weight that will allow you to perform 15-20 reps, but stop at 5. As in the previous sets, do these 5 reps as explosively as possible on the positive portion of the rep, then slow and controlled on the negative. This stage will serve as a second power set and will help you build more explosiveness in the muscle group you're training. For sets 3 and 4, jump up to a weight you can do for 6 reps. Perform as many reps as possible, ideally reaching failure at or around the sixth rep at set 3. For set 4, don't worry about how many reps you can do. Keep the weight the same as in set 3, and do the best you can. Try to perform your set 4 reps quickly and explosively, even though the heavy weight will prevent you from moving very fast. Just trying to lift a heavy weight as explosively as possible can help increase both power and strength, which is the purpose of this stage. Sets 3 and 4 are the peak of the pyramid. From here, you'll descend back down the pyramid. This stage is really made up of 3 dropsets, with set 6 including the possibility of an extra dropset. For set 5, choose a weight that allows you to complete 10-12 reps. Complete as many reps as possible until you reach muscle failure, which should be between 10 and 12 reps. Begin set 6 by reducing the weight 40-50 percent and doing as many reps as possible until you reach failure. Your goal should be to complete at least 15-20 reps. If you can't complete at least 15 reps, move on to dropset 7. Begin set 7 by reducing the weight by another 10-30 percent, depending on how many reps you have left. Complete this dropset until you reach muscle failure. Do your reps for these two final sets at a slow and controlled pace on both the positive and negative portions (about 1-2 seconds on the positive and 2 seconds on the negative). Your combined rep count for sets 6 and 7 should be at least 15. If you couldn't do 15 reps in set 6 this week, your goal for next week should be to either complete 15 reps at last week's weight—or reduce the weight a bit and see if you can get your 15. Once you can do 15-20 reps at a weight, try to do more reps week after week at that same weight. The combination of ascending sets, descending sets, and rep-speed changes in the Power-Pyramid technique produces a training program that develops power, strength, and mass gains. Your goal each week should be to use more weight than the week before while still hitting the prescribed rep ranges for sets 3, 5, and 6. Don't worry about increasing the weight for sets 1 and 2. You can try adding more weight for these sets, but only if it doesn't limit your rep speed. You can do the Power-Pyramid program using either a body-part split or with full-body workouts. In my original Power-Pyramid plan, which is currently up on JimStoppani.com, I have the program laid out as a four-day split: chest, triceps, and calves on day 1; legs and abs on day 2; shoulders, traps, and calves on day 3; and back, biceps, forearms, and abs on day 4. These days, I'm big on full-body training. Recent research shows that training all major muscle groups during a single workout is more effective than a body-part split when it comes to burning body fat and staying lean. At 49 years old, my top priorities are staying as lean as possible while also maintaining muscle mass and strength. Doing full-body Power-Pyramid workouts is a great way to maintain those priorities. In the coming days, I'll be posting all of the full-body Power-Pyramid workouts I'm doing this week on my Facebook page. You'll be able to see these workouts in their entirety, and then stick around and follow me throughout the rest of my day. I typically recommend using compound/multijoint movements when you do the Power-Pyramid program. The exceptions are bicep, forearm, and calf training because there are so few multijoint movements available to train these muscles. Otherwise, compound exercises work well with this program because you can maximize power and strength generation (the major focus of this routine) with multijoint pushing, pulling, and lower-body movements. Compound moves are also great for gaining muscle mass. If, like me, you use the Power-Pyramid plan with whole-body training, you are free to choose any form of exercise you like, such as the use of resistance bands. How long you rest between sets depends on the set as well as your goals. If your primary objective is to maximize strength, power, and muscle growth, rest 1-2 minutes after set 1; 1-2 minutes after set 2; and 2-3 minutes after sets 3 and 4. Take no rest at all after set 5, since it's a dropset. Rest 2-3 minutes after finishing set 6 (or set 7) before returning to set 1 to begin the next exercise. It should take 2-3 minutes to move to the next exercise and set the weight and other equipment. If your goal is to maximize fat loss, I recommend replacing one minute of rest between sets with one minute of cardioacceleration. Cardioacceleration involves replacing your rest periods with your choice of cardio activity. For example, instead of resting for 2-3 minutes after set 3, do 1 minute of squat thrusts, followed by 1-2 minutes of rest. If your goal is to maximize fat loss and minimize time in the gym, replace your entire rest time with cardioacceleration before moving on to your next set. Because the rep ranges for the Power-Pyramid plan are so repetitive, I recommend following this plan for a maximum of four weeks. Or, as I am demonstrating on my social media, use the technique for a week—or even a day—then bounce back to it from time to time to help you ramp up your power and strength development. To see the Power Pyramid technique in action, visit Jim Stoppani's Facebook page. In the coming days, Jim will be posting the Power-Pyramid workouts he himself is performing.